This week's Monday Mouthful challenge was Flammekueche, and I was pleasantly surprised at how it turned out. I was a little fearful because although the recipe came from a trustworthy source, I had never made it before. I decided to go the traditional route because 1) I like traditional Flammekueche and 2) I forgot to get the fruit to make the dessert one! Good thing, though that I forgot the fruit because the entire two "pies" were eaten up at dinner. I did make one minor change and used red onions instead of the typical yellow onions--because I used up all the yellow ones the night before! I think I prefer yellow onions, but this was still tasty and very close to what I've had in restaurants here in Strasbourg. The only changes I'd make would be to roll out the crust a little more and season the crème fraiche a little more heavily for added flavor. If you weren't able to participate, I encourage you to try this...it's a great and easy alternative to pizza and would make some fabulous hors d'oeuvres. Thanks to the other bloggers who participated this week! Please take a look at their takes on the traditional Alsatian dish--their submissions all had me drooling! The Daily Spud--True to form, The Daily Spud made a lovely potato Flammekueche, which elicited an excited, "Wow! That looks good!" from my husband. ChefE at CookAppeal--ChefE, as always, took the recipe a couple of steps further and added some beer to the crust and asparagus to both her "pie" and to her Flammekueche calzones...yummm! And ChefE has announced next week's French challenge...Champignons de Paris! This challenge will be left open to your imagination, so we're looking for dishes (hopefully French ones!) that use mushrooms or are served with a mushroom sauce. If you haven't had a chance to join us yet, please feel free to jump in whenever! As always, if you participate, please email your link to me at mindysmouthful(at)gmail(dot)com or ChefE at elizabeth(at)cookappeal(dot)com! We'll post our results, your links, and the next challenge on Monday. 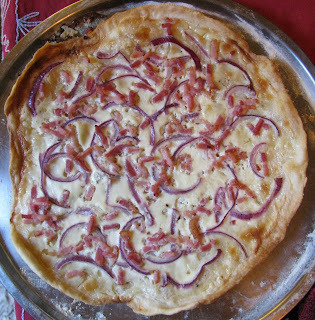 I have never heard of flammekueche- looks delicious. It's so cool that you are blogging from France. About the mini sized cheesecakes, I baked them for about half the time. I always halve recipes to cut down on the amount of desserts in my house so I have to keep checking on them to make sure I don't overbake. Good luck with your blog! I loved the taste of the creme, but mine was a little runny this time. I could imagine though how it all comes together in flavor and now know why you love it...Thanks for sharing this!